If you’re in need of dental implant surgery in Forest Hills, Dr. Bella Normatov has performed hundreds over the years and is one of Queens’ top dentists. Dental implants are permanent prosthetic teeth attached to a titanium post. This post is inserted into a patient’s jawbone and acts as a root for the tooth, providing a stronger base then the previous tooth. Dental implants allow you to replace teeth that are lost due to decay, gum disease or trauma. Improved appearance: They look and feel like your own teeth. They become permanent, “perfect” teeth, as they are custom made for your face and are fused with the jawbone. Improved speech: Dentures and other replacements aren’t fit as firmly as dental implants therefore they can slip and move as you talk. This causes mumbled or slurred speech, as good as your natural teeth. Improved comfort: Removable dentures often cause discomfort, whereas implants are “woven” into your own jawbone and are much more comfortable. Eating: Chewing food is easy and painless, just as with a person’s natural teeth. Improved confidence: Implants provide a firm, perfectly sized and shaped tooth (or teeth), without any movement. You can feel good about your perfectly aligned smile. No need to ever remove your teeth. Durable: They are very durable and last for many years, with proper care and regular dental visits many implants last a lifetime. Convenient: No need for adhesives or bonding compounds as with removable dentures. Oral hygiene: Easy to clean and care for her. Same as natural teeth. What does dental implant surgery consist of? Initially Dr. Normatov will surgically place a dental implant composed of a titanium post into the patients jawbone. This is performed by initially removing some of the gum tissue and exposing the bone. Sophisticated dental software is used in order to strategically place the dental implant in the space. The exposed area is then covered once the implant is placed and the process of osseo-integration takes place. Dr Normatov then will schedule another appointment in 3 to 6 months after the post has become fused with the patients jaw. This process is known as osseointegration and takes place over a few months whereby the titanium post will become fixed to the jawbone. When the patients returns to see if the process of osseointegration has been successfull, Dr. Normatov will remove some of the gum tissue in order to see if the titanium post has fused with the jaw bone. In most cases this will have been enough time for the patients titanium post to fuse to the bone. 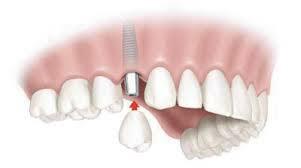 The crown can then be affixed to the titanium post known as the abutment. The patient must practice good oral hygiene practices and have regular visits to the dentist that will aid the life of the dental implant.